Firstly, congratulations to Shanna for winning the Tangled Tides ebook (I rolled a dice on Random.org to find the winner). Shanna, please send me an email (anyawillowfan at yahoo dot co dot uk) so I can pass your email onto Rhemelda publishers who will send you a copy of the book. Secondly, I want to let you all know why I haven't been posting regularly for a few weeks. Basically, the first few weeks I didn't post I was really ill, I couldn't sleep properly and my M.E. flared up to the point that I could only just watch DVDs of my favourite shows. I wasn't able to come online as my brain just couldn't understand anything I read. This past week I have been feeling slightly better. I am beginning to feel like I was before I got ill (so, still almost housebound, but at least I can do a little each day now if I have plenty of rest). However, instead of posting here, I have been using that energy to work on my new website. It is nowhere near ready yet, but I am going to be sending you there later this week regardless as I know you would rather be invited early and see the site evolve as I slowly finish it. I hope you are as well as possible and had a good weekend. 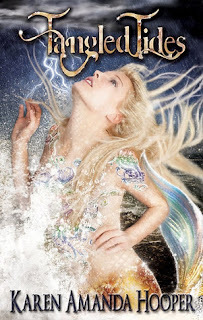 Tangled Tides is a contemporary book about magic and myth, featuring mermaids, sirens, selkies and gorgons, all in a completely new light. I have to admit that I was expecting a dark twist on the world of merfolk, but I think the story could be interpreted as dark or as a beautiful fairytale. The story is told in first person through the eyes of the three main characters. I actually found this a bit of a problem in enjoying the story as I spent a lot of time trying to work out whose voice I was reading, rather than experiencing the story. While I think it would have been better told in third person, the positive of reading the different character perspectives made each side’s point of view crystal clear and understandable by the reader. I found this book difficult to read for the first third as I felt it spent too much time telling me about the mer-world, rather than diving into the story. However, once I was past this point, the story suddenly became so intriguing that I found myself reading for hours, unwilling to pause as I wanted to know what was going to happen. I would recommend Tangled Tides to anyone who still believes in fairytales or who enjoy discovering different ways of thinking. At the core, Tangled Tides is a book about a young girl deciding who she is, which the author shows through the different species involved.